For this post in my Belgium train series (part 1), I will feature freight trains and trams. I was hoping to wrap this series up in one post, but there are too many photos that I want to share, so I'm splitting it up. 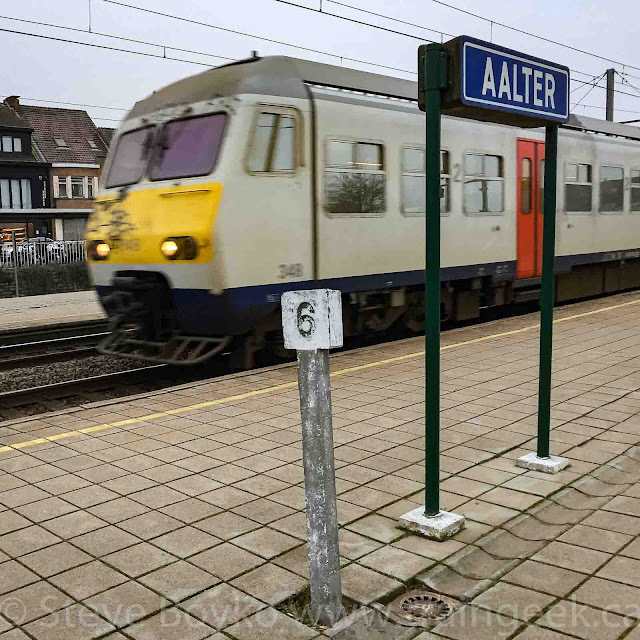 There are certainly more passenger trains than freight trains in Belgium, at least on the lines I saw. 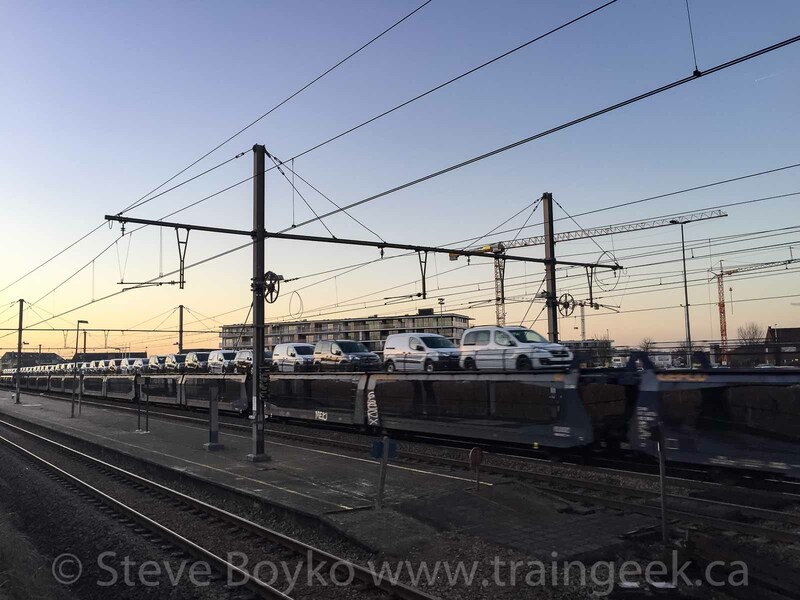 The freight trains run on the same tracks as the passenger trains, but far less frequently. Freight services are provided by private companies. 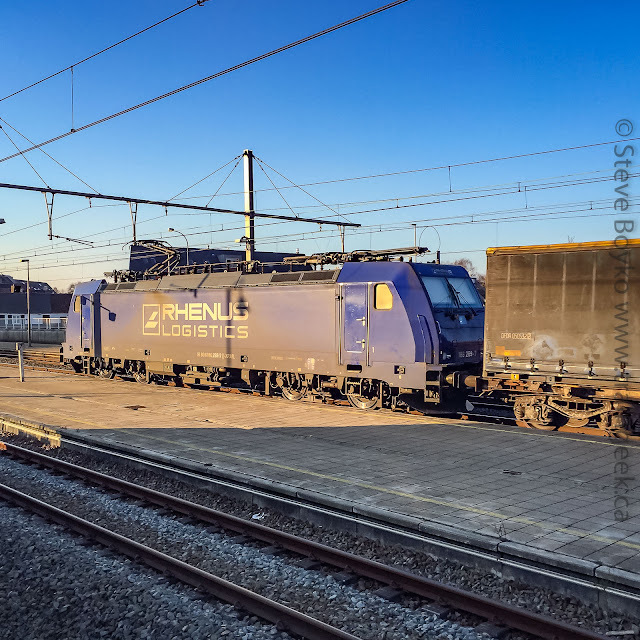 The locomotive below is owned by Rhenus Logistics, a very large multinational company. This particular locomotive is a Bombardier TRAXX MS, one of three purchased for cross-border electric operation. The container train was a relatively short single-stack train. I think it had about 20 platforms. Notice that the car on the right is at least two platforms long, as the truck (wheels) is shared between the two platforms. We have similar cars in North America, and they are called "3 packs" or "5 packs". 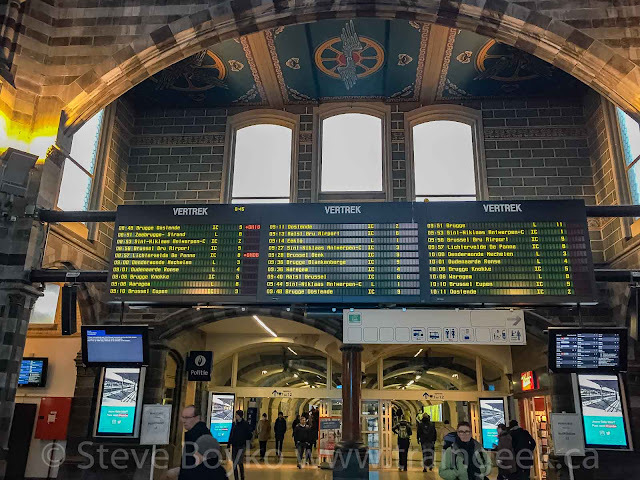 I think it's pretty safe to say that Europe does not have any double-stack (one container on top of the other) trains due to tunnels, overpasses and other limits to how high a train can be. 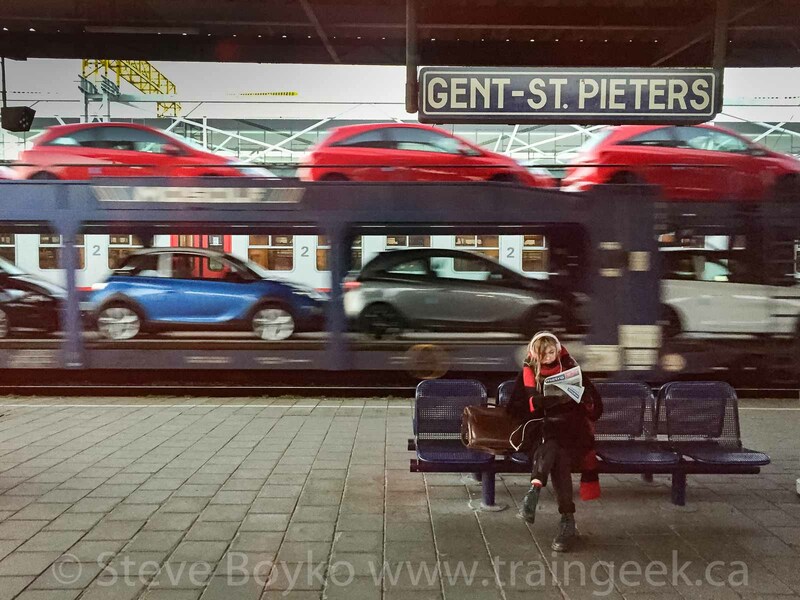 Here's a train I spotted in Ghent while rolling by. Europorte 4001 is a diesel-electric locomotive, a Stadler (or Vosslo) EURO 4000 model. These six-axle locomotives are relatively new, with the first of the series built in 2006. They have an EMD 710 diesel under the (rigid) hood and are used in freight service. Note the dual cabs so the crew is always facing the direction of travel. European tank cars are interesting to me as they seem to lack the top valving and safety cage that North American tank cars have. Ghent has a maintenance-of-way depot which featured a few interesting pieces of rolling stock. It took me a few days to capture a decent photo of it with my phone. I liked that outside-braced boxcar very much. European railways "sweat the assets" too, it seems. 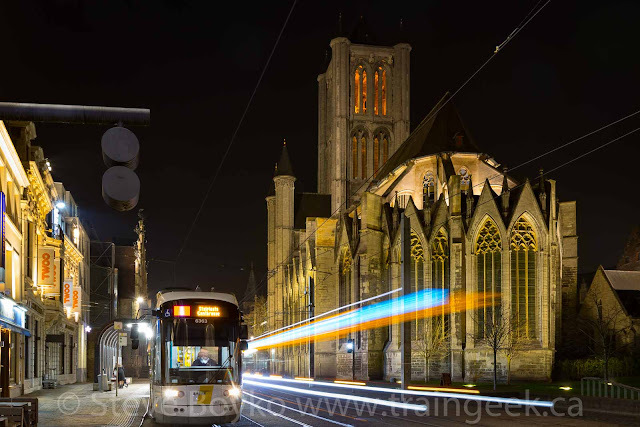 Ghent and Brussels both had sizable fleets of trams, or streetcars if you prefer. These modern trams travel over three different lines in the city. We took trams 1 and 4 between the train station area (where our bed and breakfast was) and the touristy Korenmarkt area. I think these are Bombardier Flexity trams but I'm not 100% sure. 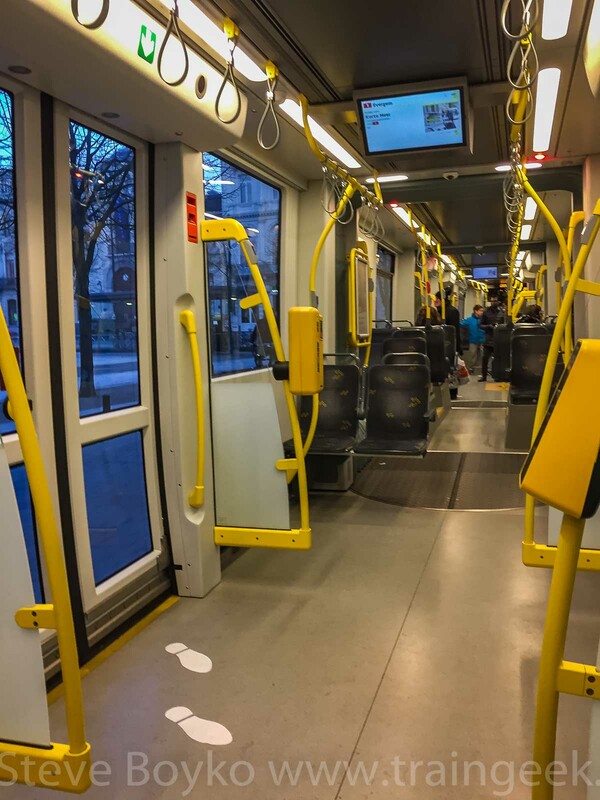 The trams are really nice inside - brightly lit, spacious with lots of handholds. There are not as many seats as you would think there would be, but I guess the total capacity is higher if you force more people to stand. I noted in the mornings that these trams were pretty full. It's amazing what curves and tight spaces these trams can get through. 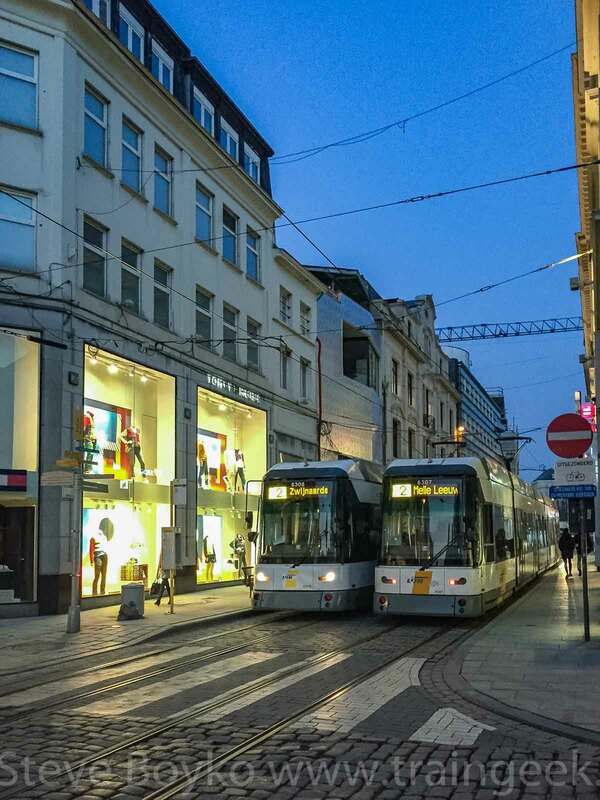 We walked down some pretty narrow streets in Ghent and they had tram tracks running through the street. Unfortunately for us, they closed one tram route after we had taken the tram to the Korenmarkt area for some delicious fondue. 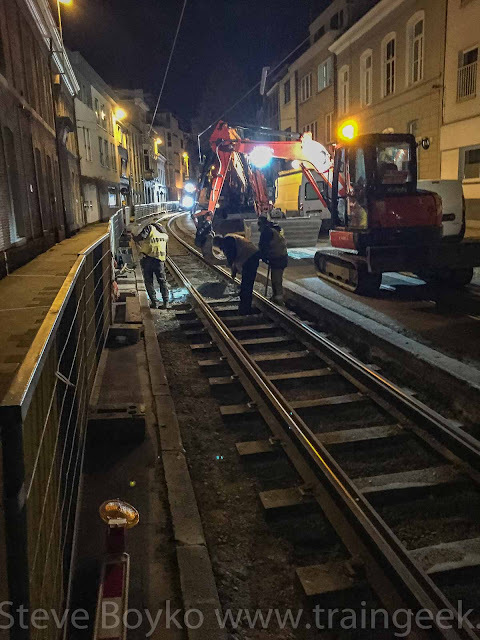 We had purchased our return ticket and stood waiting at the tram stop for close to an hour before someone walked by and told us that they saw some work being done on the tram line. We were a good 20 minutes' walk from our hotel, but it was a nice night so we decided to walk back. On our way, we passed the work area and saw a crew doing some track work. I've been working on the.. tram line.. all the live long.. night.. While in the Korenmarkt area, I amused myself by taking some long exposure photos... some of which included trams. 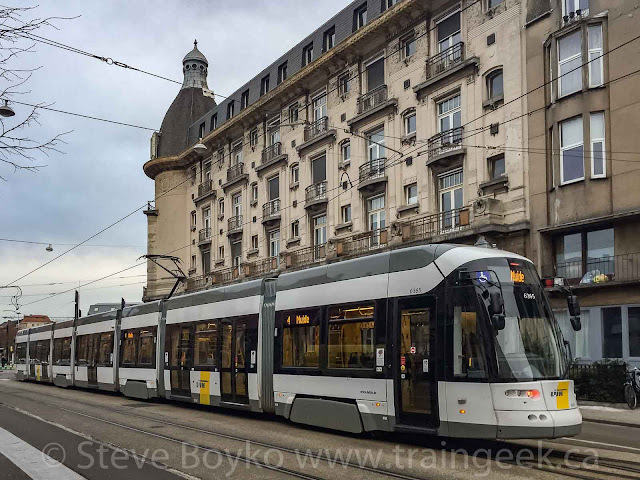 I already posted some tram photos from Brussels in part 1 and part 2 of this series. The Ghent train station (Gent-St-Pieters) has a lovely ceiling in the main station area. I shared an external photo of the station in my last post. 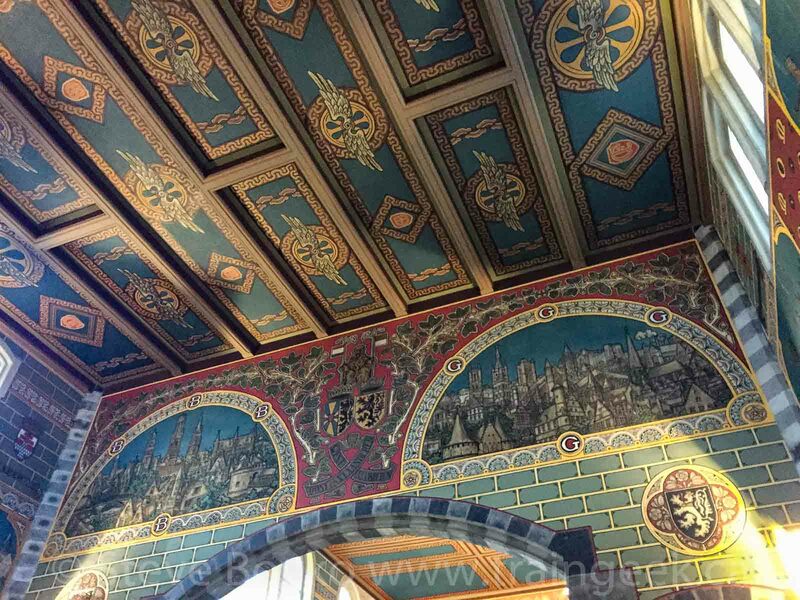 The Brugges train station (Gare de Bruges) is, quite frankly, ugly. 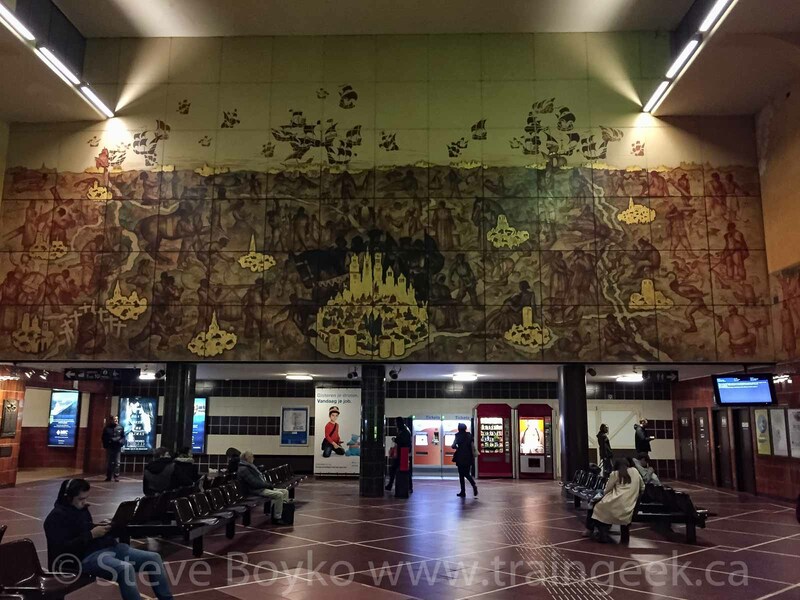 It was built in 1939 and is an uninspiring yellow brick station. I couldn't bring myself to take an external photo of it, but I did like some of the art inside the station. In my next post, I will finally wrap up the Belgium series with some sunrise / sunset photos of trains in Belgium. Soon! PS one Belgian delicacy I really enjoyed was speculoos cookies. 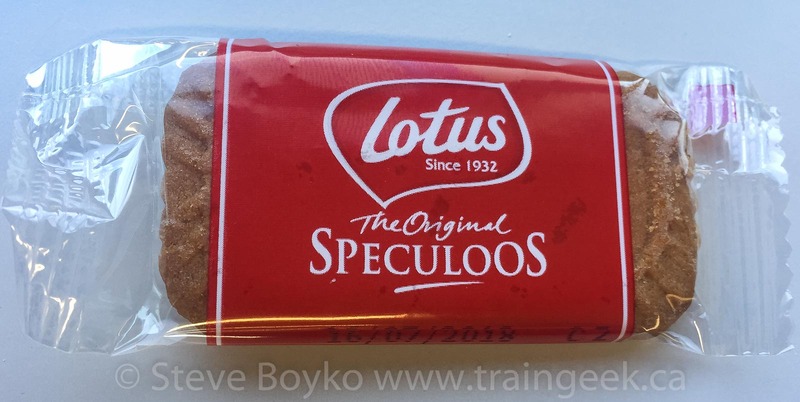 These sweet biscuits are common in the northern area of Belgium and our company provided them in the cafeteria. I ate a lot of them... those and the pastries might account for the five pounds I gained in Belgium (sigh).